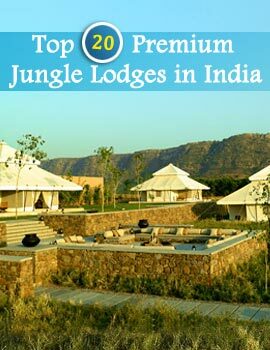 Ranthambore National Park gets its name from the fort that stands in the middle of the park. 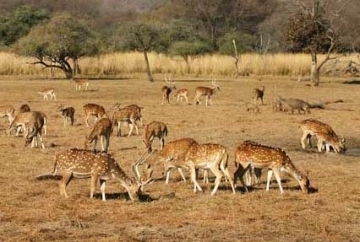 The fort is called Ranthambore and it gets its name from two hills - Thanbhor which is the hill on which the fort is located, and Ran which is a hill close by. While not much is known about the founding of the fort, what is known is that there was a settlement here as far back as the 8th century. The fort was a vital citadel for the control of central India, with the result that many wars were fought for its possession. Due to its location and structure, it was one of the most difficult forts to overthrow. Records show that the fort with stood the assaults of people life Kutub-ud-din (1209), Allaudin Khilji (1301), Feroz Tughlaq (1325) and Bahadur Shah of Gujarat (1530). The most successful ruler of this fort was Rao Hammir in the 11th century. It is said that in 1381 ten thousand women committed johar or mass suicide rather than fall in the hands of the ruler of an opposing and victorious army. In 1528, the control of the fort went into the hands of the Mughals. In the 17th century Ranthambore fort became a prison fortress where prisoners were executed by stuffing them with opium and throwing them down from the fort walls. An account of the execution was given by Francois Bernier, a traveler of the 17th century in his book "Travels in the Mughal Empire, 1656-68". In this book he said that prisoners were kept on an average for two months, before the Governor would have them brought out. They would then be placed on the top of the wall and after having them drink some milk (decoction of the milky juice of the poppy), they would be cast down headlong on the rocks below. The opium was given to the prisoners to make them insensible. The Mughals gifted Ranthambore Fort to the Maharaja of Jaipur in the late 19th century. 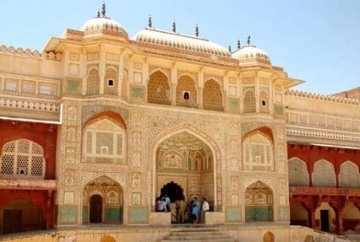 The fort then remained with the royal family of Jaipur, and the surrounding forests became their hunting reserve. The fort is huge, with the circumference of its walls approximately 7 kms. The area inside is 4.5 sq. kms. It is open to the public from dawn to dusk. There is no road leading to the top of the hill to the fort - there are only stairs leading from the bottom of the hill. It is a 20-minute climb but it is worth the effort. The height of the hill is 700 feet. From the fort you get a beautiful view of the park below. 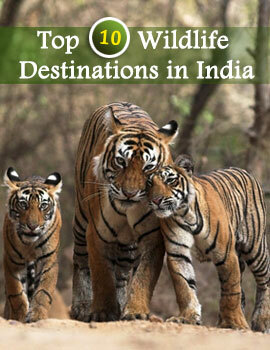 Do carry your binoculars along, because at times people have seen tigers in the park below from the fort. In winters one can occasionally see leopards sunning themselves on the ramparts. 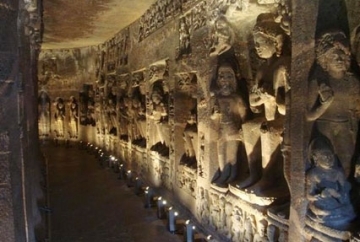 The fort attracts a lot of pilgrim traffic because of the temples located in it. The most famous of these is the temple dedicated to Lord Ganesha.